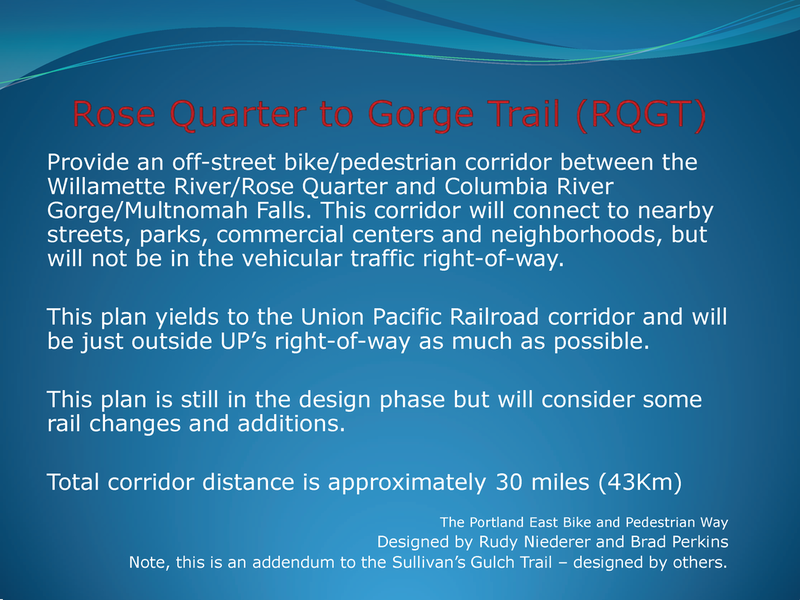 Sullivan’s Gulch Neighborhood Association joins the Northeast Coalition of Neighborhoods in unanimously endorsing the Rose Quarter to the Gorge Trail (RQGT), which includes the Sullivan’s Gulch Trail concept plan already adopted by City Council. 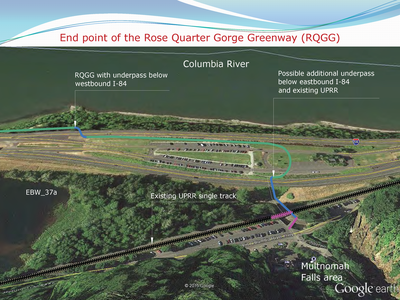 The Rose Quarter to the Gorge Trail extends the original trail concept from the Willamette River to the Columbia River Gorge and Multnomah Falls. The Trail offers the City’s neighborhoods a safe and convenient bike/pedestrian corridor that enhances existing infrastructure through a seamless grade-separated pathway meeting the needs of recreational, commuting, shopping and other trip types. 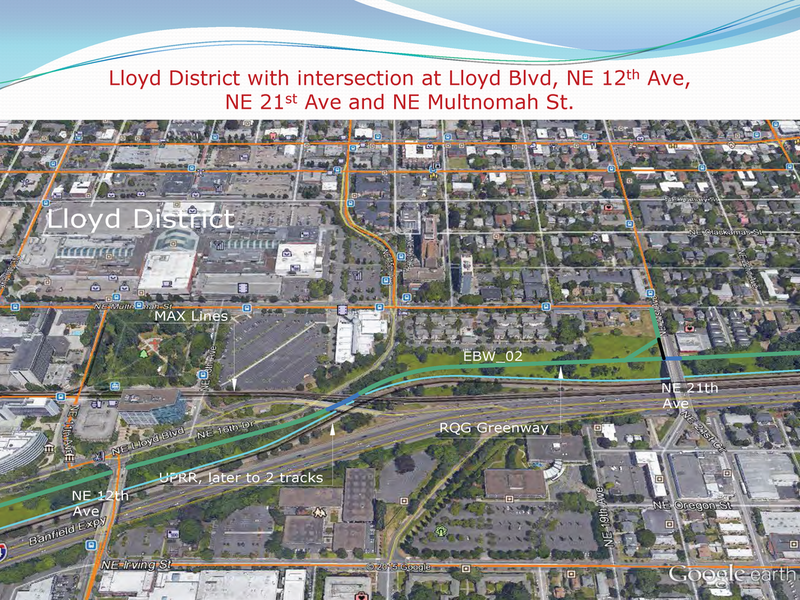 This east-west route could connect all north-south bikeways into a single system, including the Green Loop in the Lloyd District and the proposed Sullivan’s Crossing Pedestrian/Bicycle Bridge. 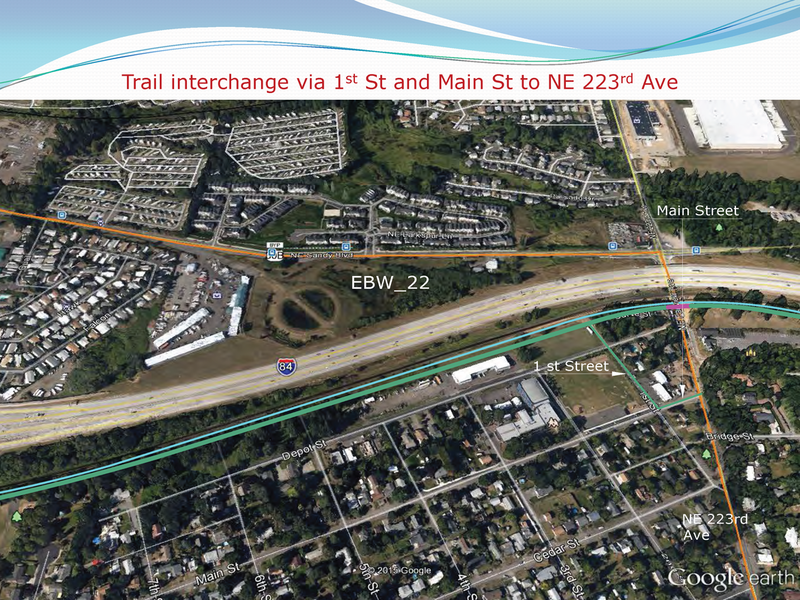 We firmly believe City investment in the Trail will maximize the value of ongoing investments in bikeways and safe streets and contribute a critical component of the multi-modal network necessary to sustain regional economic activity. 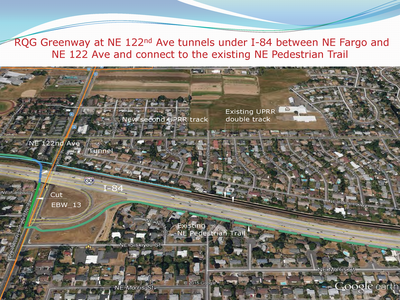 The Trail will also stimulate and complement new development of affordable housing along the I-84 corridor, attracting residents who prefer to walk and bike to their destinations rather than require parking at their residence. It might also serve as a critical route for City and neighborhood response teams to reach impacted areas in the event of a disaster. 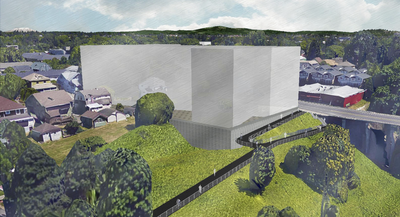 near-term, in order to achieve our mode split and greenhouse gas emission reduction goals. We are encouraged the City now includes the Sullivan’s Gulch Trail on the Comprehensive Plan 2035 Major Trails Map and PBOT has proposed funding construction of its first segment, from the river to NE 21st Ave, during the first ten years of its Transportation System Plan. 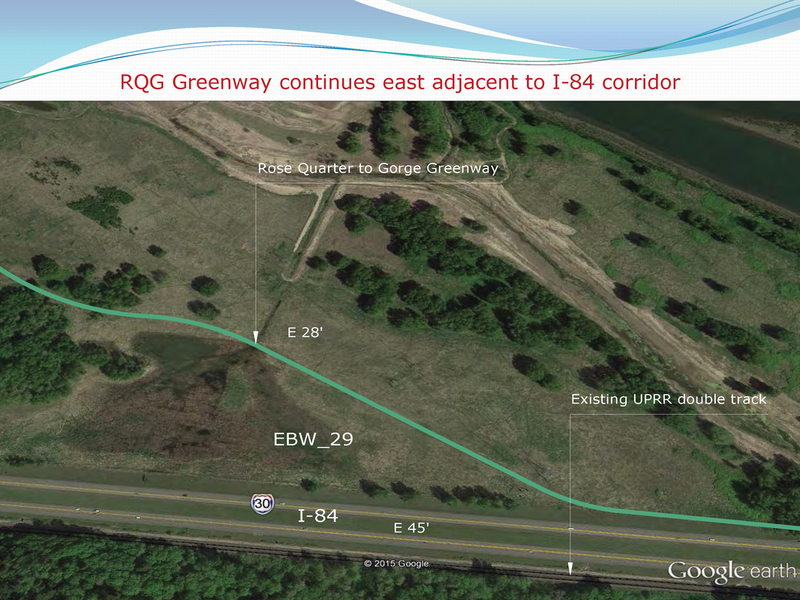 The sooner the Trail is engineered, the sooner the City can negotiate rights-of-way and easements through the few areas of private property along the route. 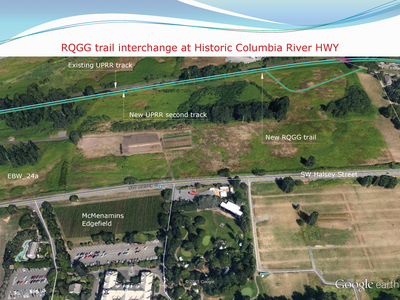 We thank Commissioner Novick for directing PBOT to request $2 million in urban renewal funds to complete a funding package to construct the Sullivan’s Crossing Pedestrian/Bicycle Bridge over I-84, from which $412,000 would be dedicated to 30% of the design of the westernmost portion of the RQG Trail. 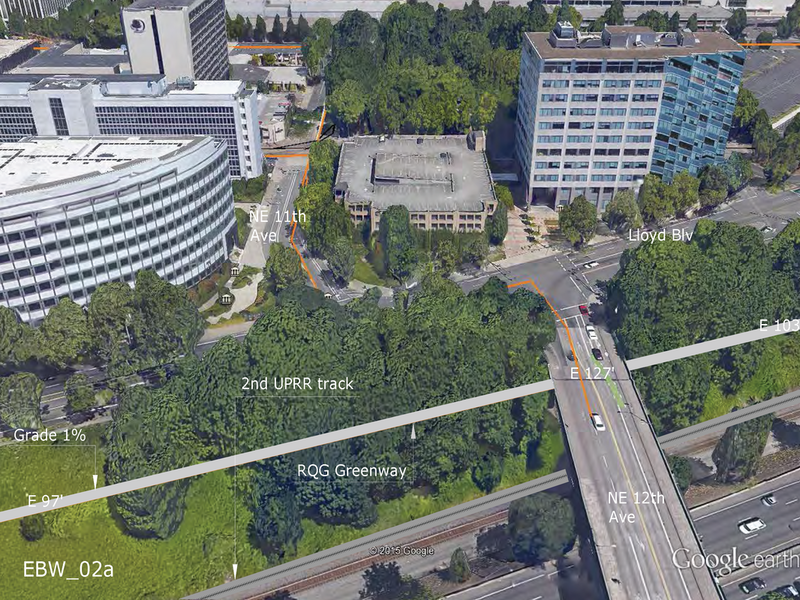 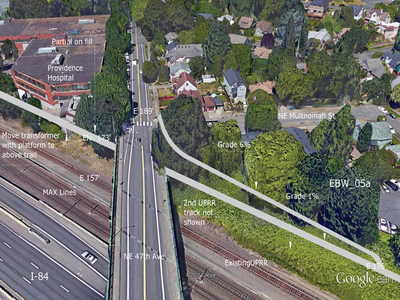 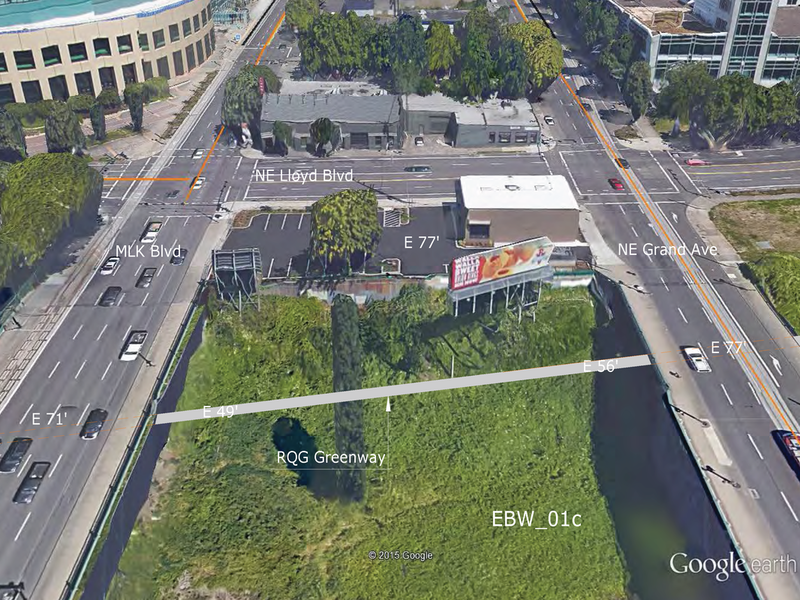 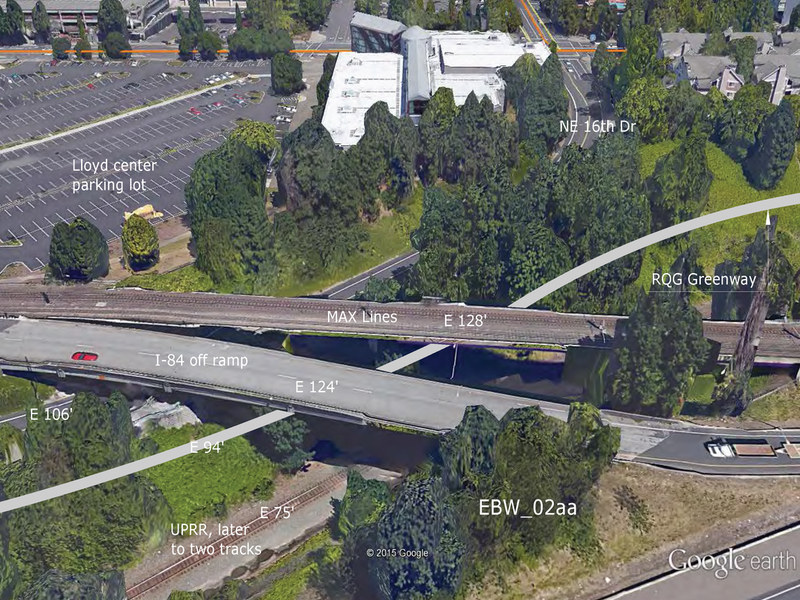 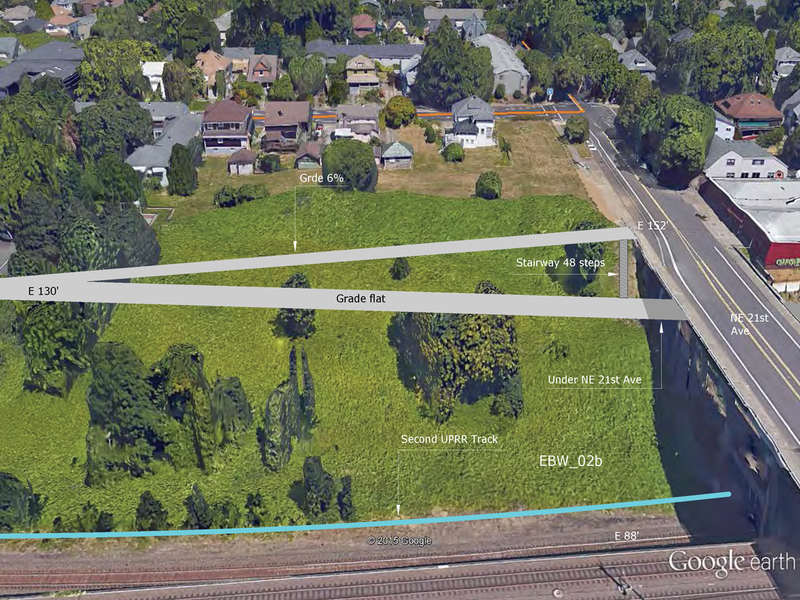 What is exciting about this proposal is the linkage of the Sullivan’s Crossing Pedestrian/Bicycle Bridge with this east-west trail, an opportunity to complete a dedicated pedestrian/bicycle connection between the Central City Green Loop and bikeways throughout the eastside. 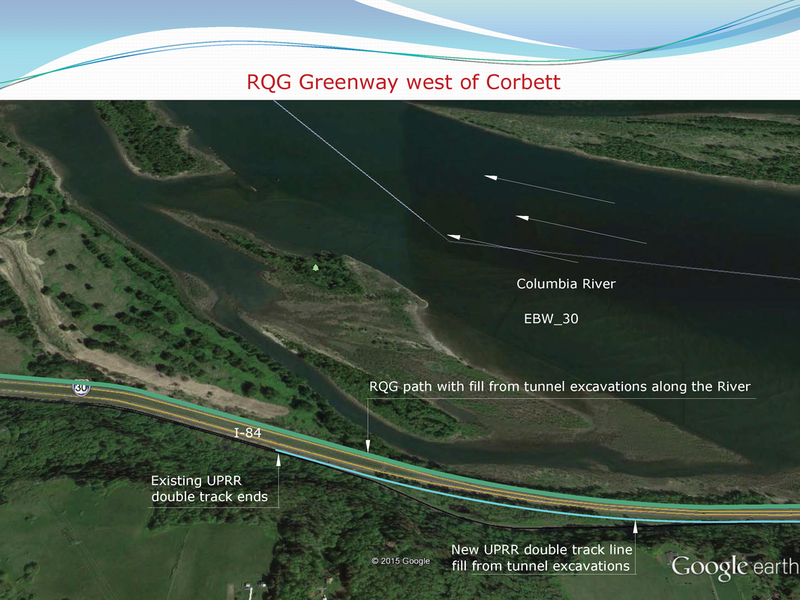 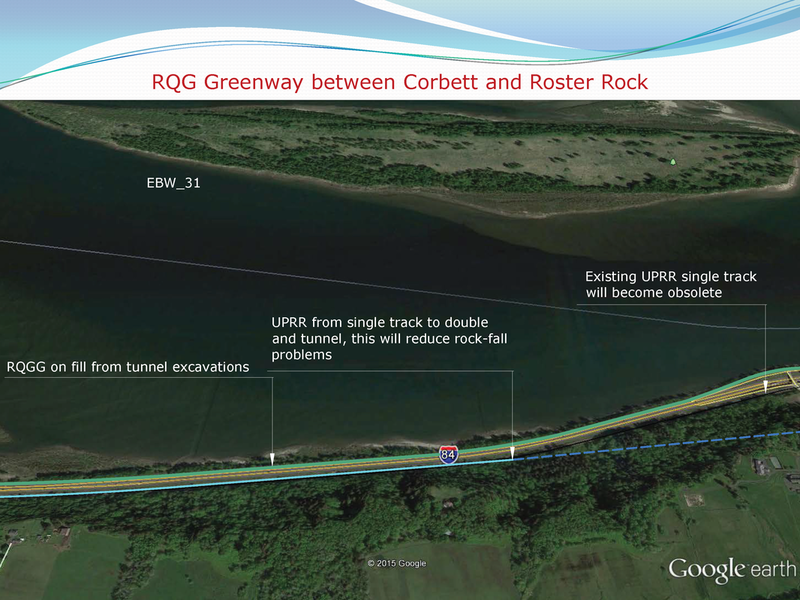 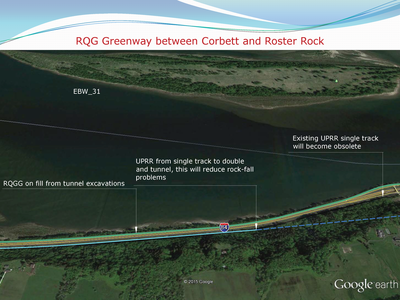 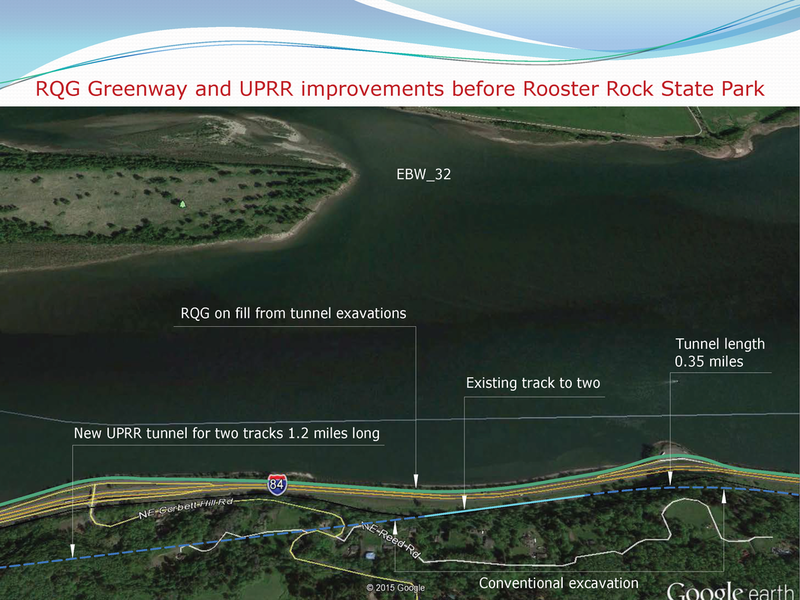 We encourage making the Bridge a direct link to the RQGT, not Lloyd Blvd., and using $1 million in CCUR funds and $500,000 in private money to fund 30% of the engineering work between the Willamette River and Gateway Green. 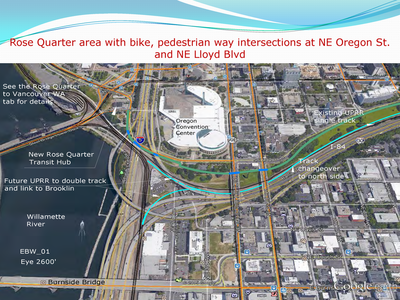 We also thank NECN for convening a working group with PBOT, PDC, Metro, State, neighborhoods, and private sector to develop a funding plan for the RQGT. 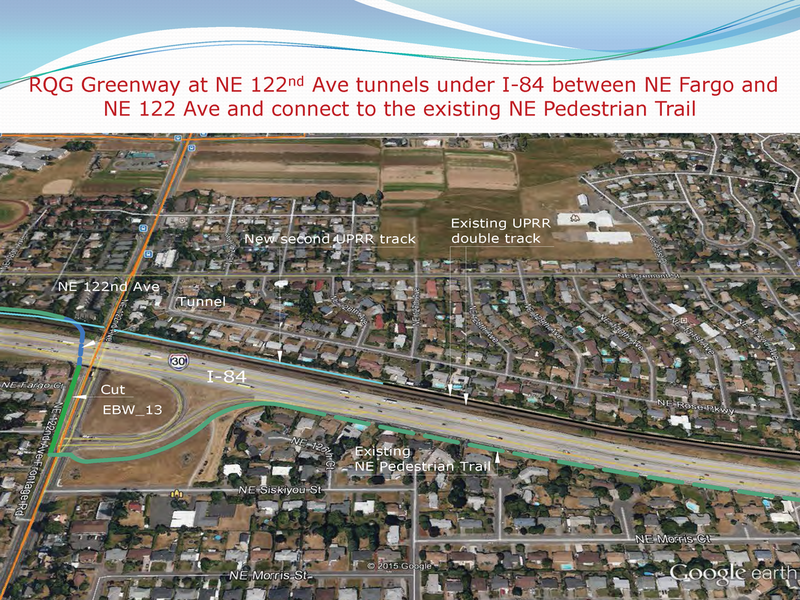 SGNA intends to participate in these discussions along with other invited neighborhood associations, coalitions, trail advocates, and partnering corporations. I move that SGNA send a letter to Mayor Hales and City Council that endorses a newly defined concept for what has previously been known as “the Sullivan’s Gulch Trail,” that we now would like to call “the Rose Quarter to the Gorge Hiking, Biking, and Walking Trail,” to emphasize how the Trail would connect the City with east county and recreational opportunities in the Columbia River Gorge. This letter of support shall attach as reference NECN’s recent letter of support for this newly defined Trail project. 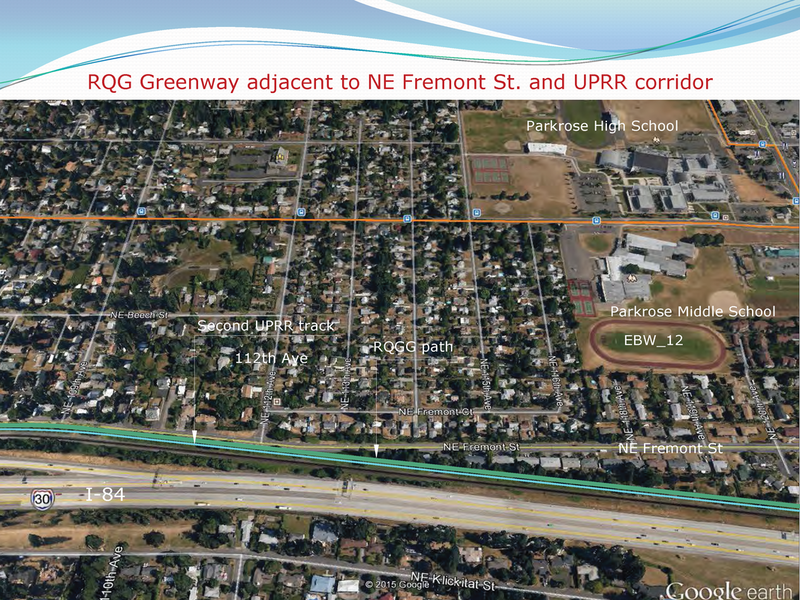 12 in favor; 0 opposed; 0 abstained; 2 excused absences. Unanimous vote with no minority position. 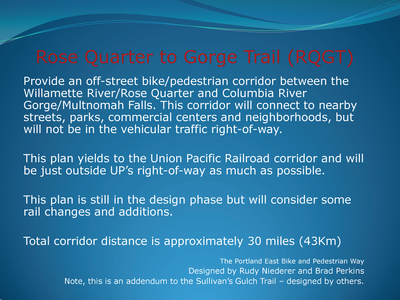 The Northeast Coalition of Neighborhoods supports the Rose Quarter to the Gorge trail project, which includes the Sullivan’s Gulch Trail Project and expands the vision for the project from one of local importance to one of regional significance, extending from the Eastbank Esplanade to the City of Cascade Locks. 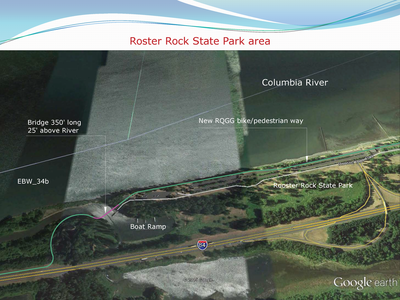 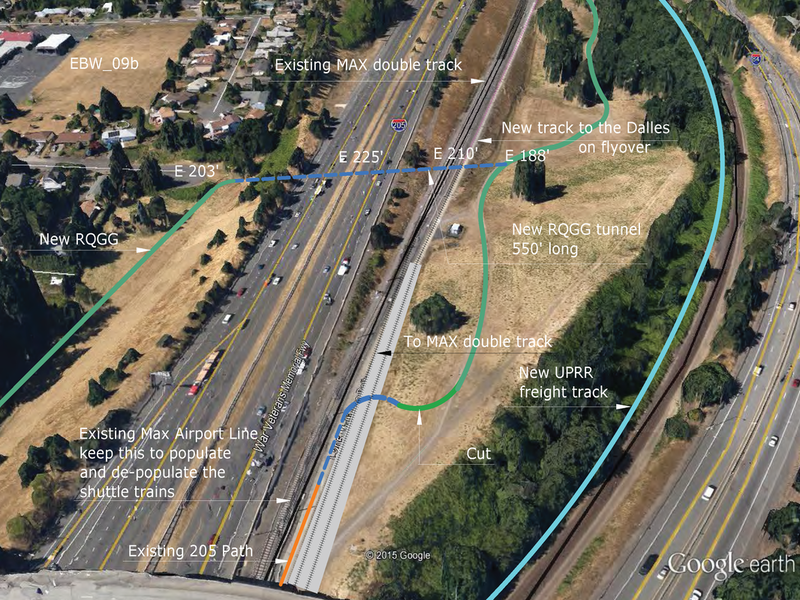 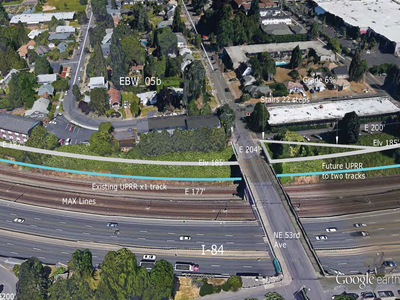 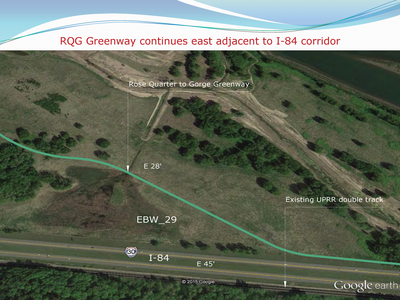 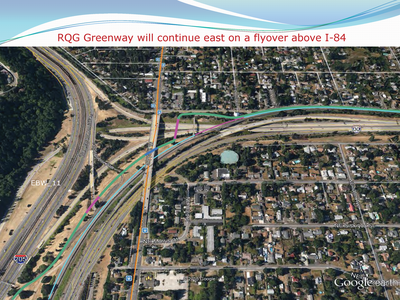 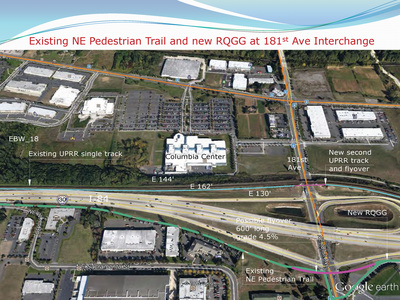 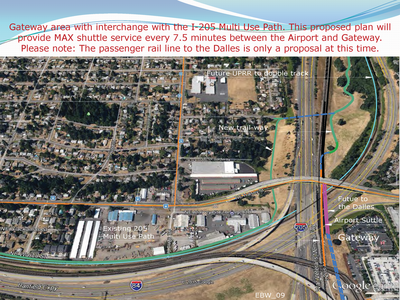 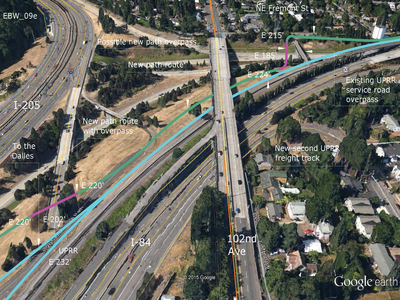 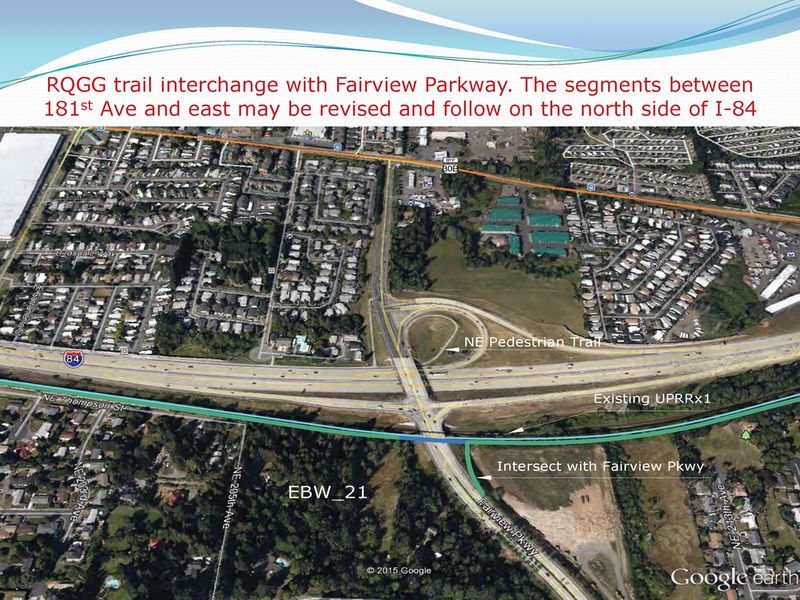 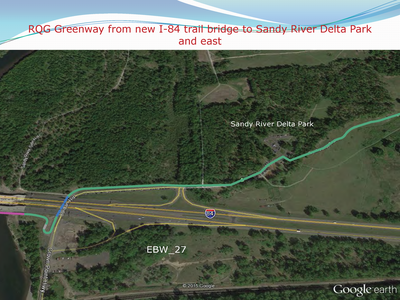 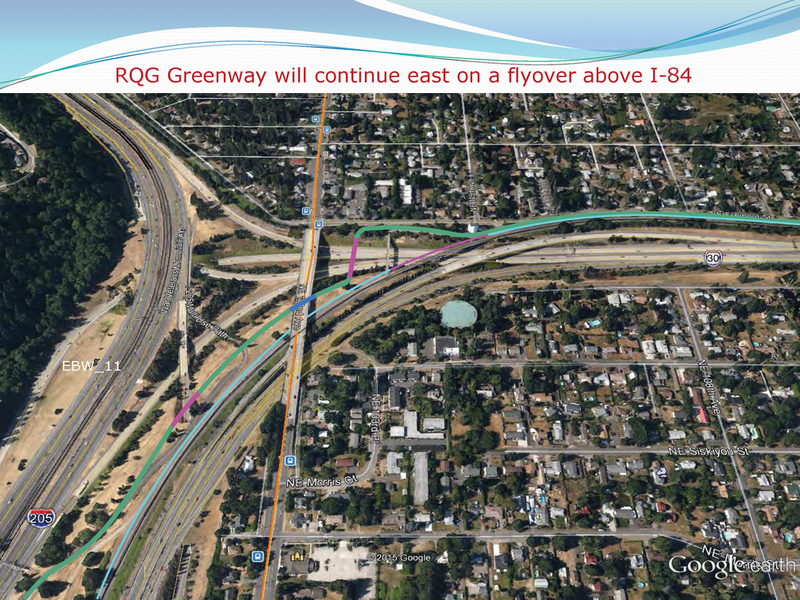 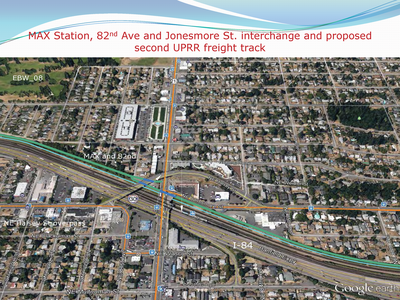 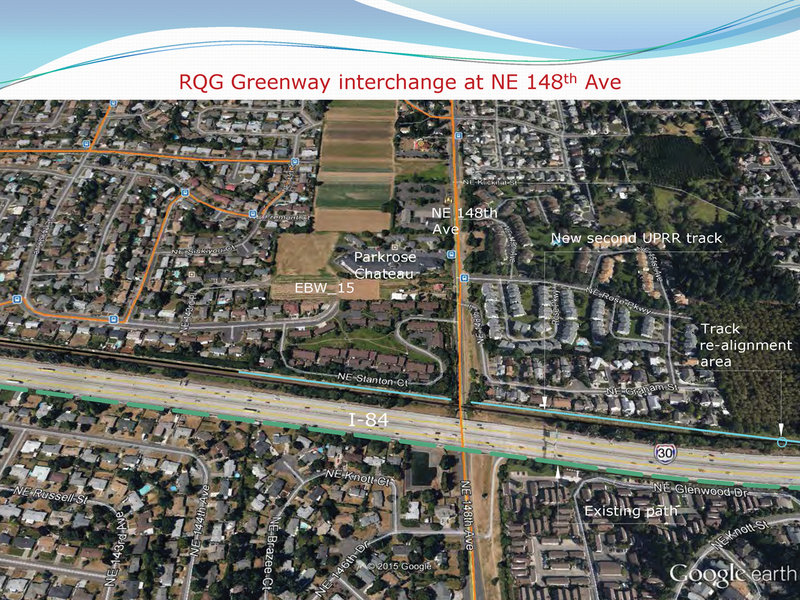 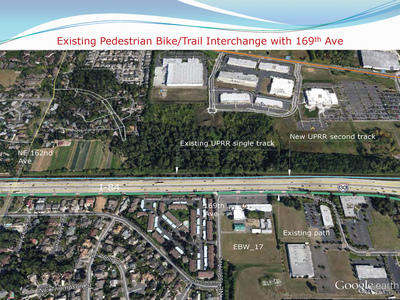 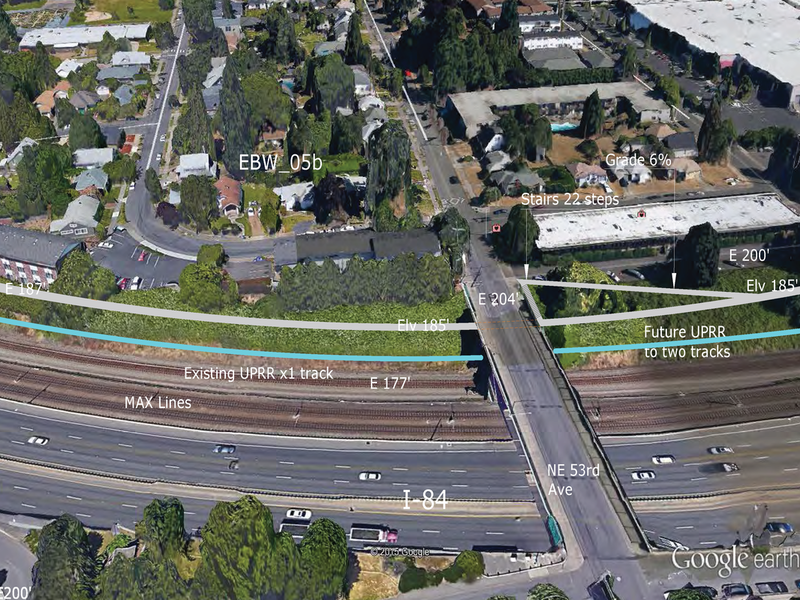 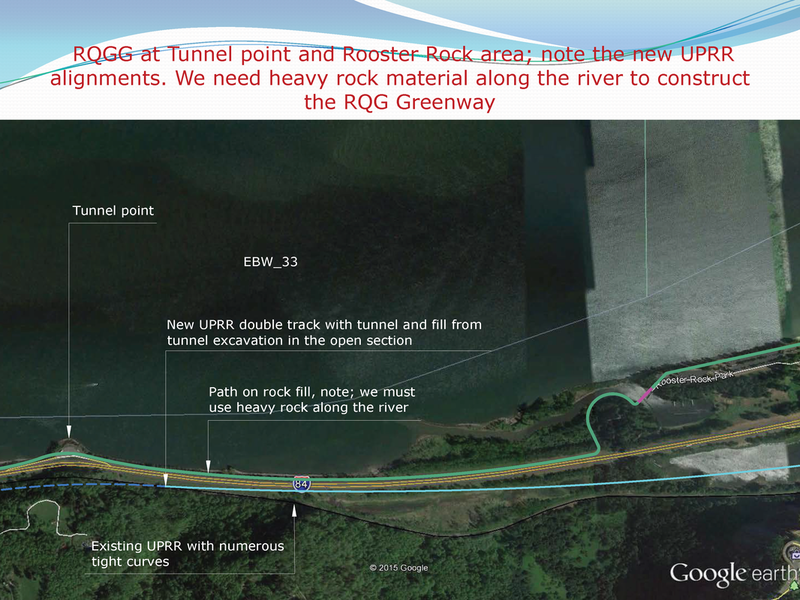 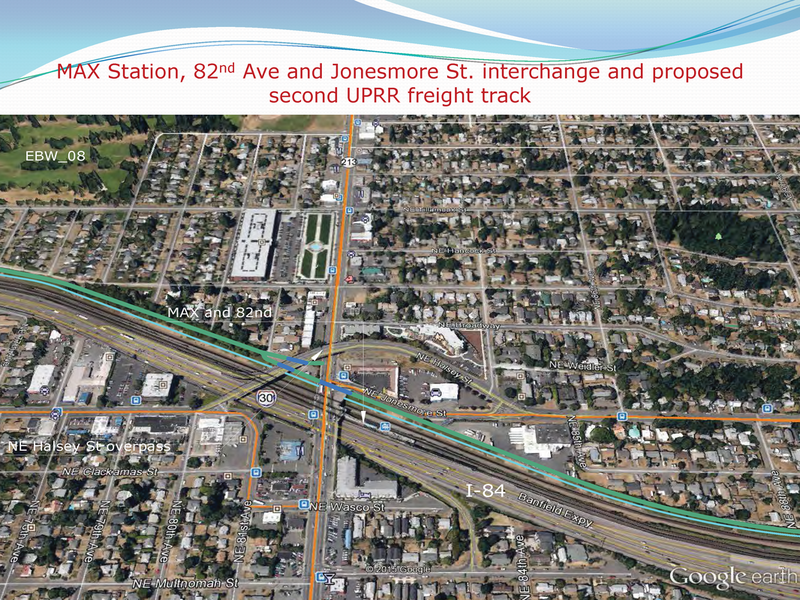 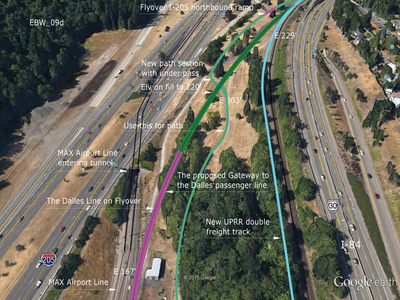 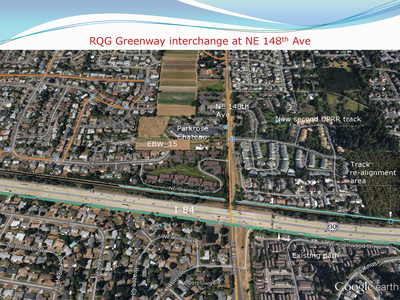 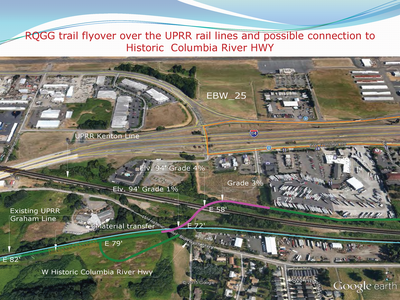 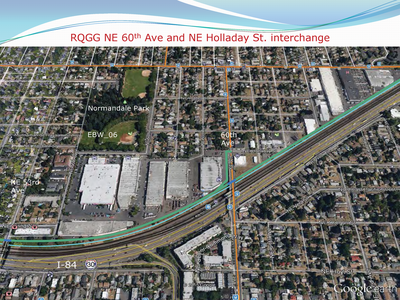 Preliminary planning has been completed for the first phase of this project, from the river to I-205. 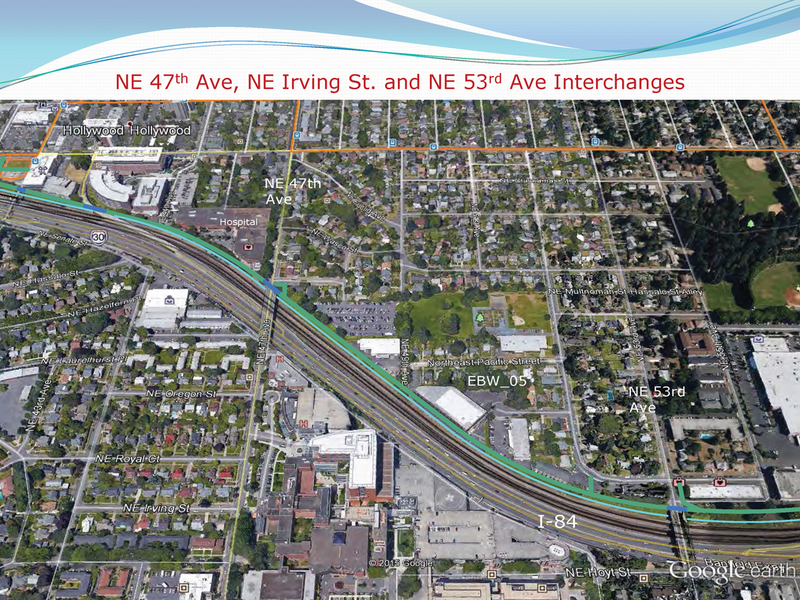 We are encouraged to learn that the City proposes to fund construction of a first segment of the project, from the river to NE 21st Ave, during the coming first ten years of the Transportation System Plan. We are in full support of moving forward as quickly as possible to deliver as much of this project as can be accomplished in the near term. 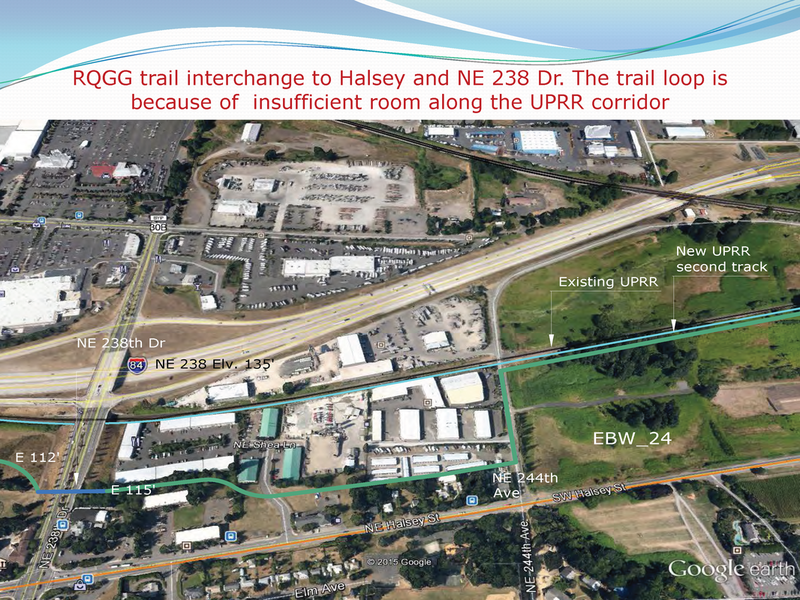 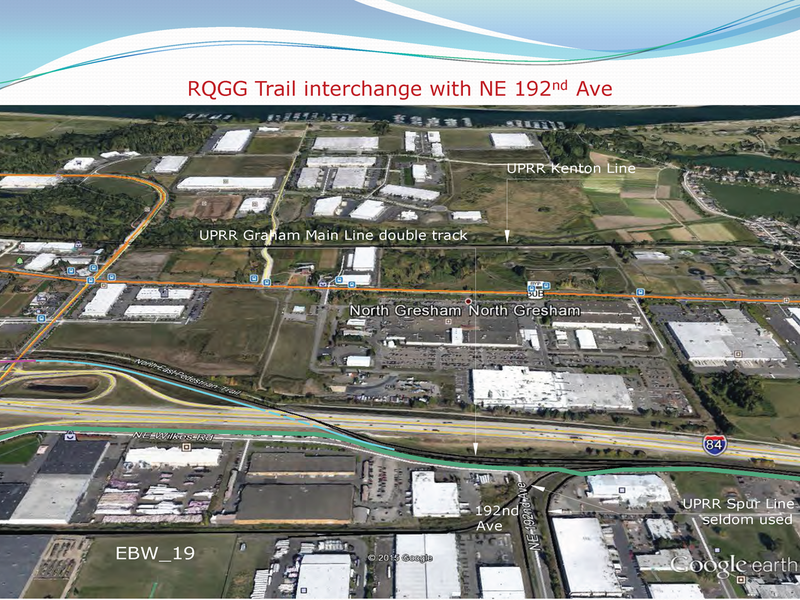 We thus encourage the City to prioritize delivery of the entirety of its portion of the Rose Quarter to the Gorge Trail Project, from the River to city limits at NE 162nd Ave along I-84. 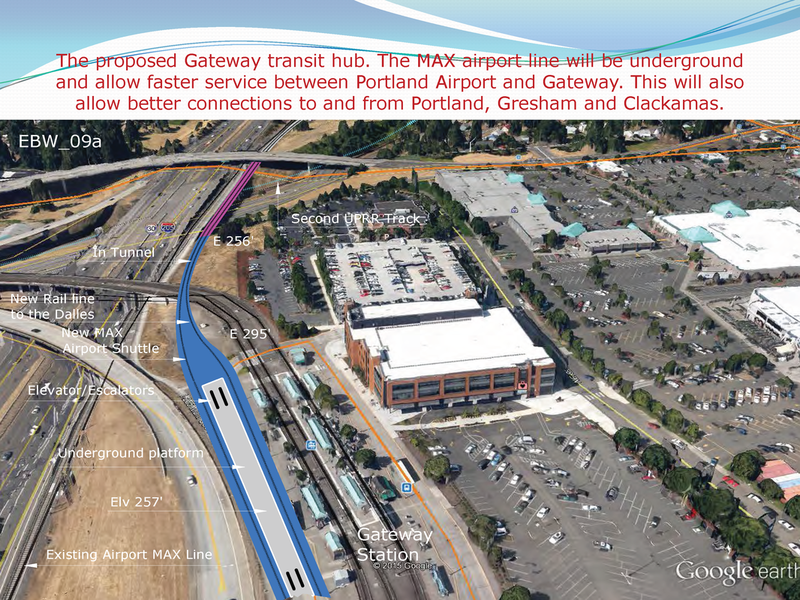 Further, we encourage the City to work with Metro, ODOT, Multnomah County, and other regional partners to develop a plan to deliver the entire project on an expedited basis, so as to allow it to play its part in helping our community reach our mode split and greenhouse gas emission reduction goals. 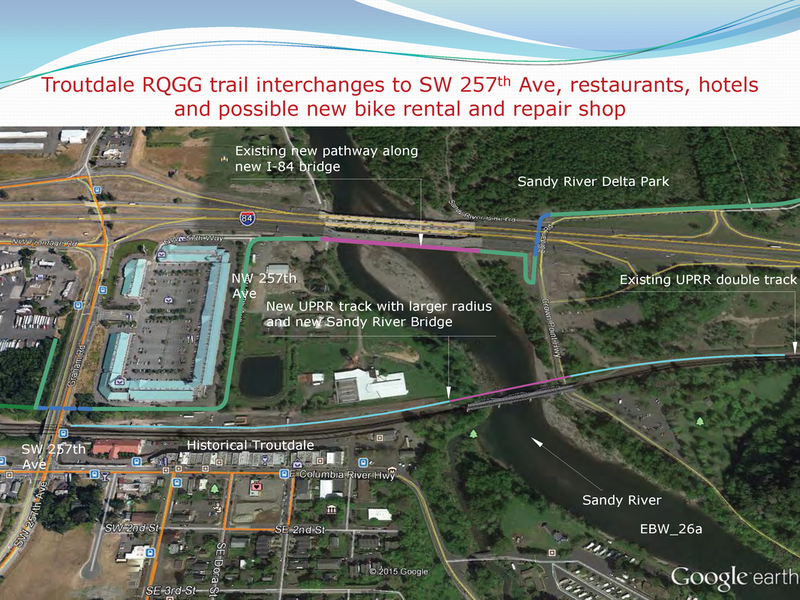 This trail project is not only a necessary addition to the Rose Quarter, Lloyd District, and Sullivan's Gulch areas, it provides the opportunity to link our central city with east county and the Gorge. 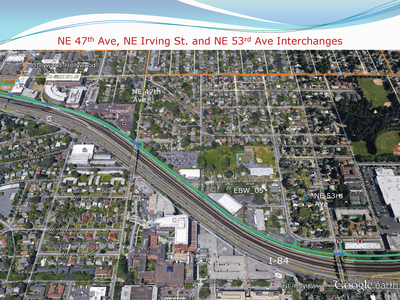 The project provides an opportunity to enhance existing infrastructure investment via a seamless system of safe, grade-separated pathways that can meet the needs of recreational, commute, shopping and other trip types. 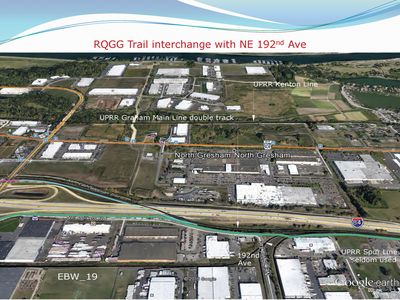 Adjacent to regional private and public investment, it provides an opportunity to complete the multi-modal network necessary to support and sustain regional economic activity. 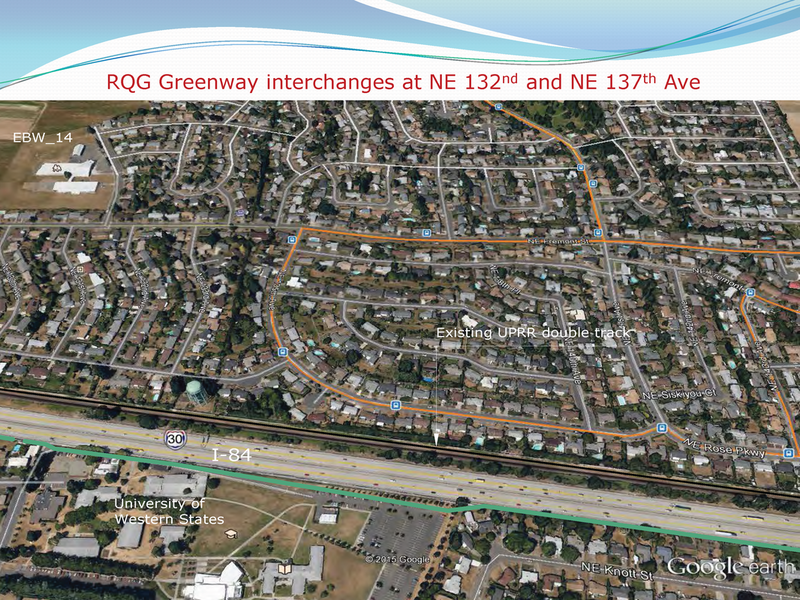 Therefore we believe this project is a priority for inner North and Northeast Portland and encourage funding be identified and secured as soon as possible. We welcome the opportunity to provide you with additional information. 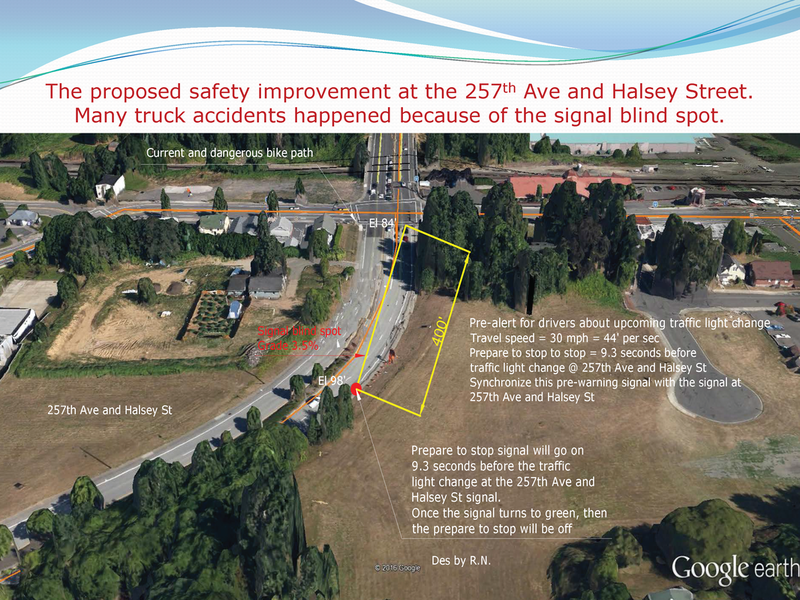 Thank you for your consideration of this matter. I’ll be brief and to the point. 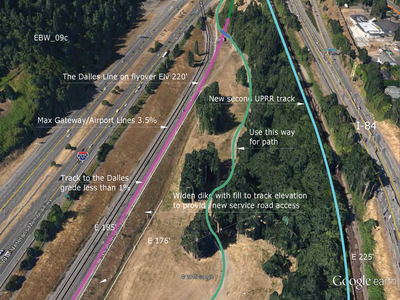 I believe we understand how Sullivan’s Gulch Trail (now RQGT) can be a real asset for commuters, recreationalists, tourists and bike-oriented development dwellers if we build it between the Rose Quarter and Multnomah Falls. 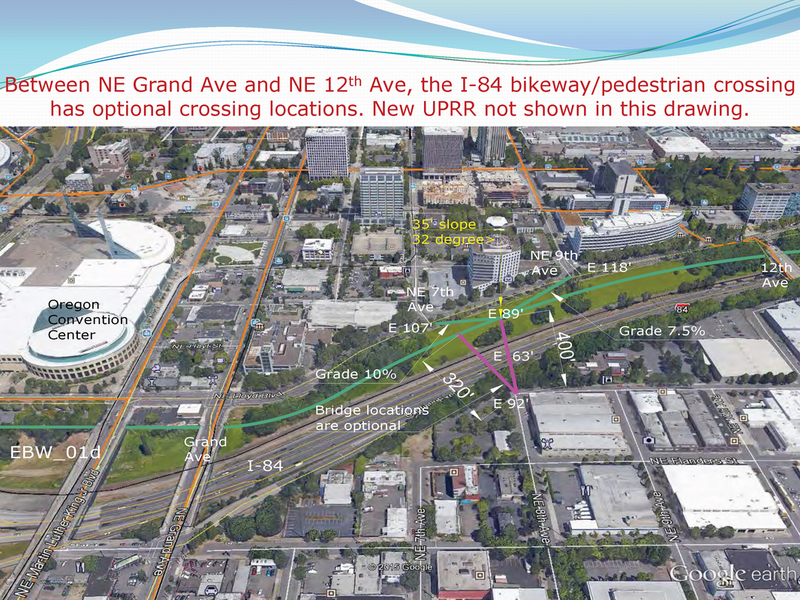 The Comprehensive Plan is now including the SGT on the official land-use map, which is a good start and requires developers to recognize it in their plans along the SGT corridor. Preliminary Engineering/Negotiating Right of Way: $2.5 million of $5 million first phase from the Willamette River to Gateway Green. 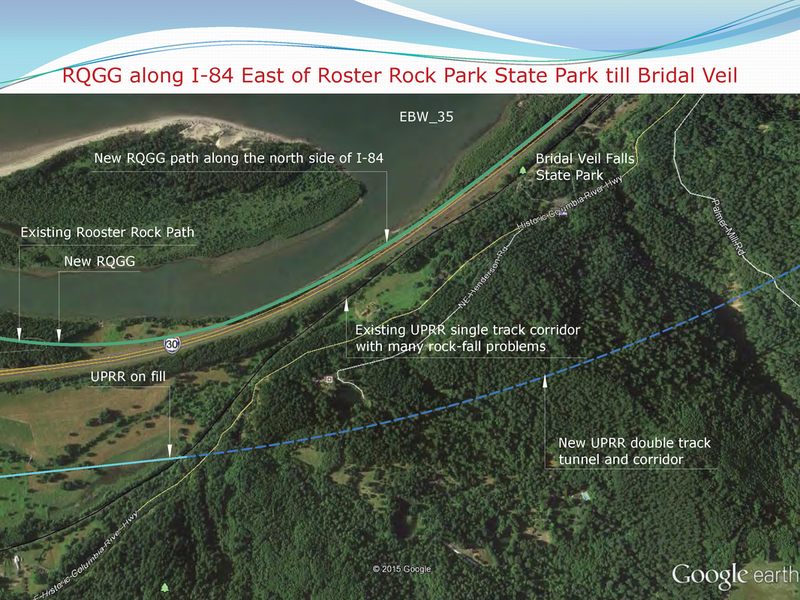 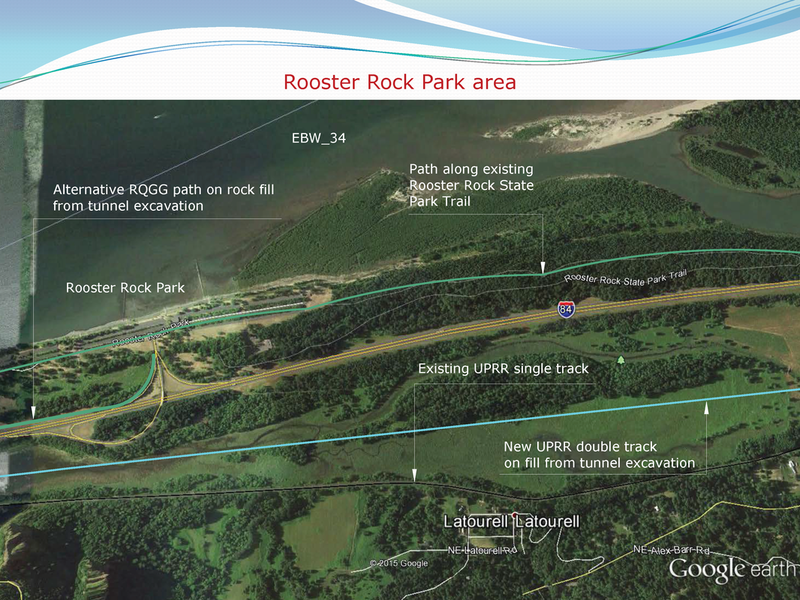 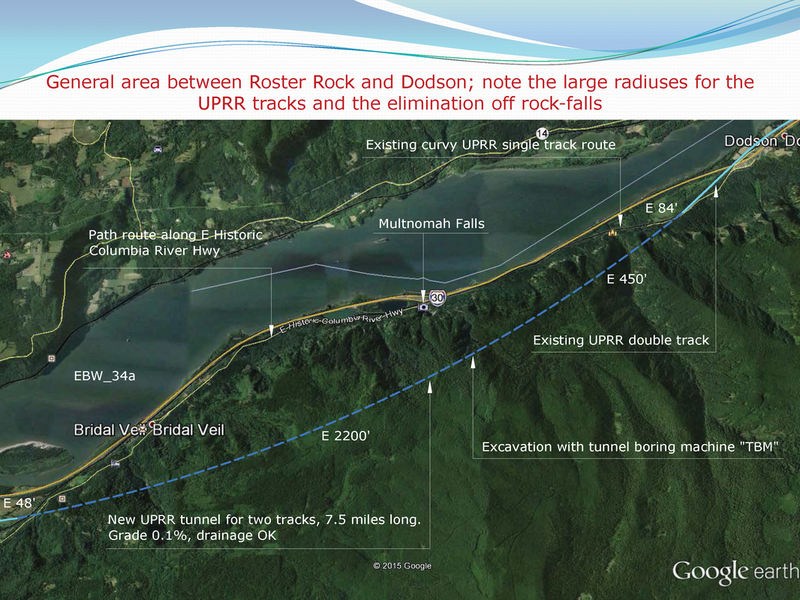 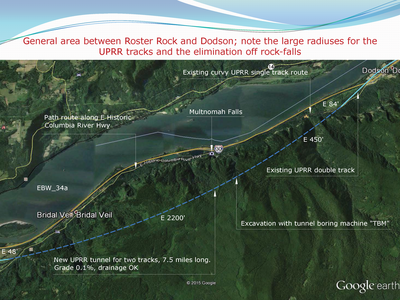 $1.25 million will be raised by Rose Quarter to Gorge Trail Advocates. * The $1.25 City of Portland match can be funded by Convention Center Urban Renewal District Funds. Final Engineering/Negotiating Right of Way: $2.5 million second phase from the Hollywood Transit Station to Gateway Green. 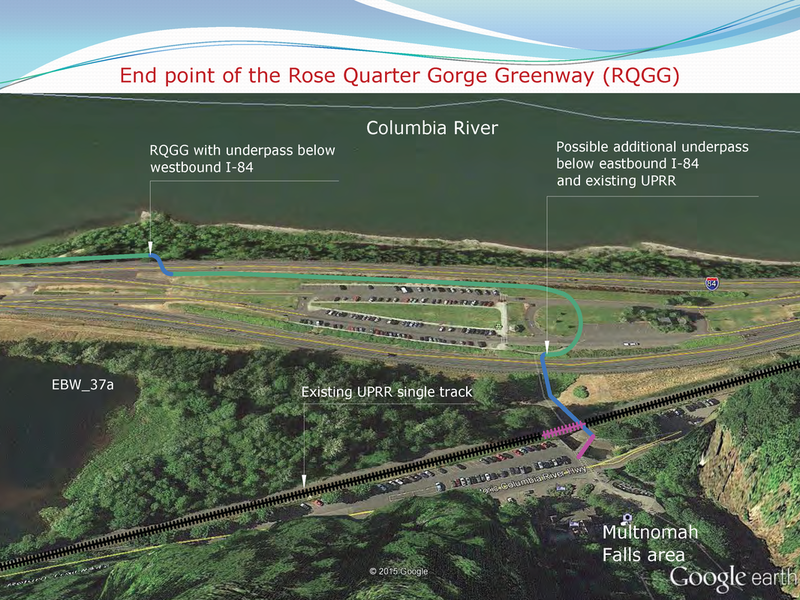 $1.25 million will be raised by Rose Quarter to Gorge Trail Advocates. 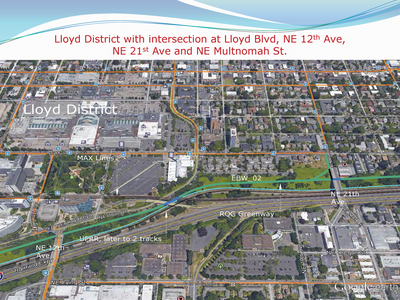 The $1.25 million match can be funded by the City of Portland, Metro and/or State of Oregon. *Possible private funding sources: Nike, Addidas, Under Armor, Providence, Legacy, etc. 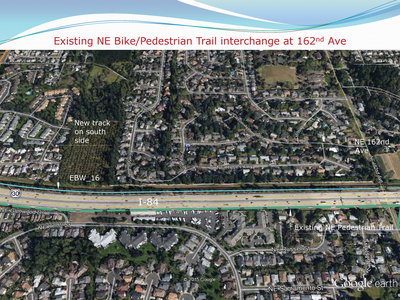 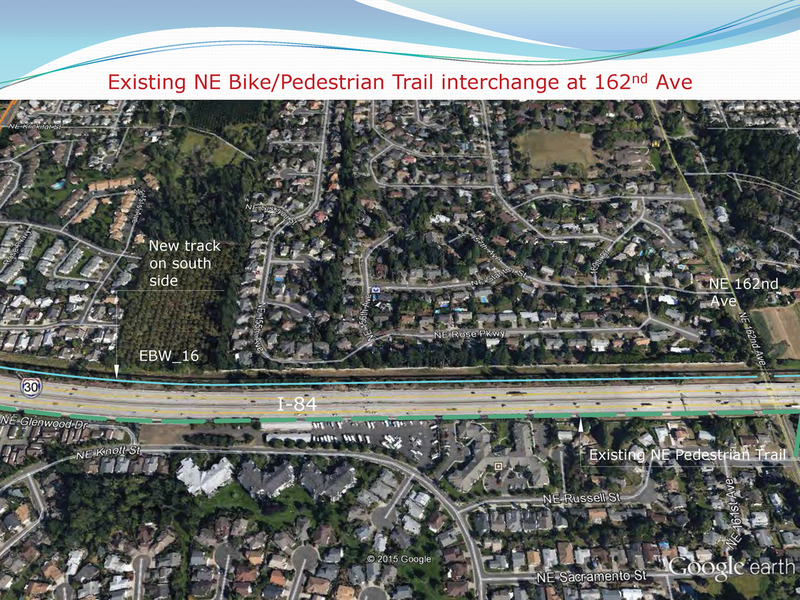 **Create a new urban renewal district from NE 16th to 181st Avenues along I-84 and use the tax increment financing for trail construction costs. 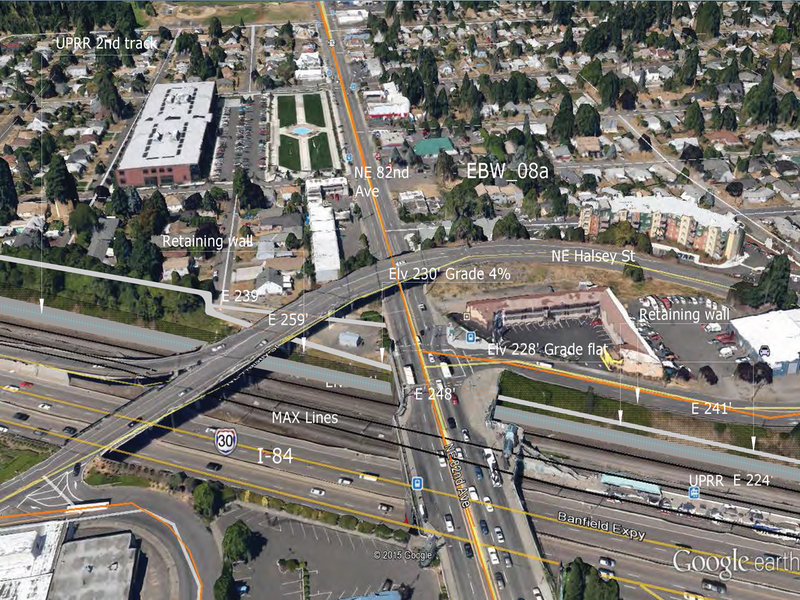 Call it a “string of pearls,” with the pearls being the bridgeheads across I-84, where bike-oriented development is planned or will be developed adjacent to I-84. 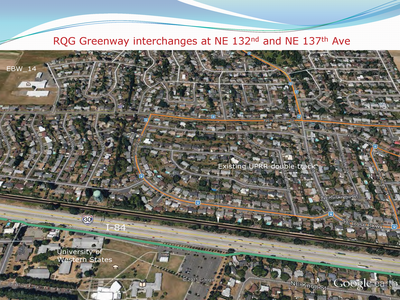 Over a dozen neighborhoods adjacent to the RQGT have registered their overwhelming support. 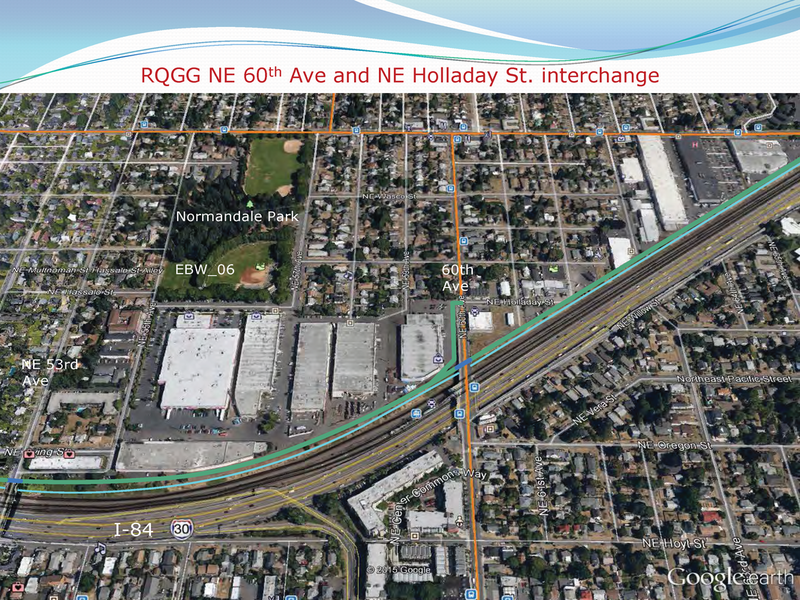 I and five others wish to meet with you regarding our commitment to work with your public jurisdiction to make it happen. We are open to your suggestions for a better financial plan. cc: Ted Grund, Garlynn Woodsong, Daniel Pirofsky, Jim Parker, DJ Heffernan, Art Pearce, Lake McTigue, Jillian Detweiler. Let the fight for safe bike trails begin. 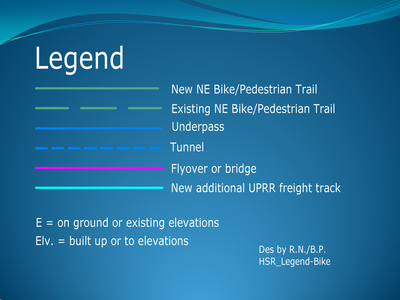 Neither Commissioner Steve Novick nor the Portland Bureau of Transportation (PBOT) gets it. 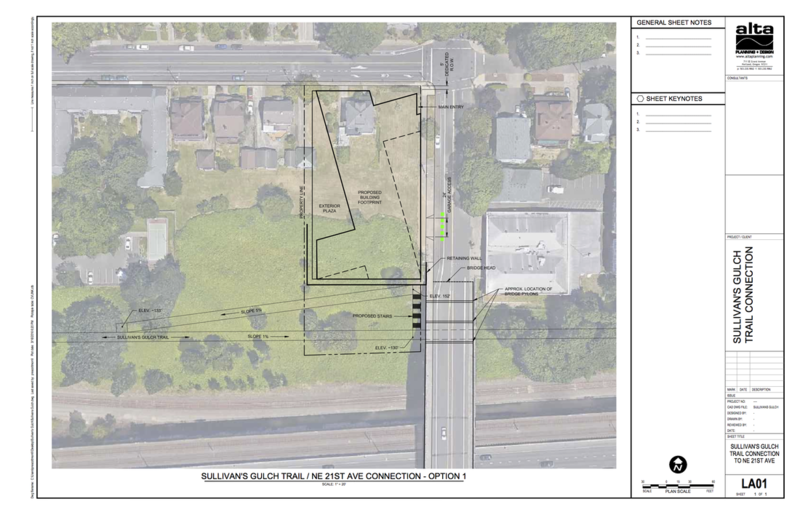 It has been nearly four years since the Portland City Council voted unanimously in favor of the Sullivan’s Gulch Trail Concept Plan. 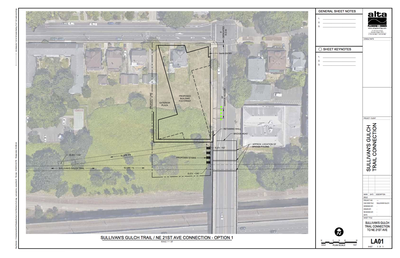 Six years of work by NE neighborhood representatives to get us to City Council approval, and nothing has happened since. 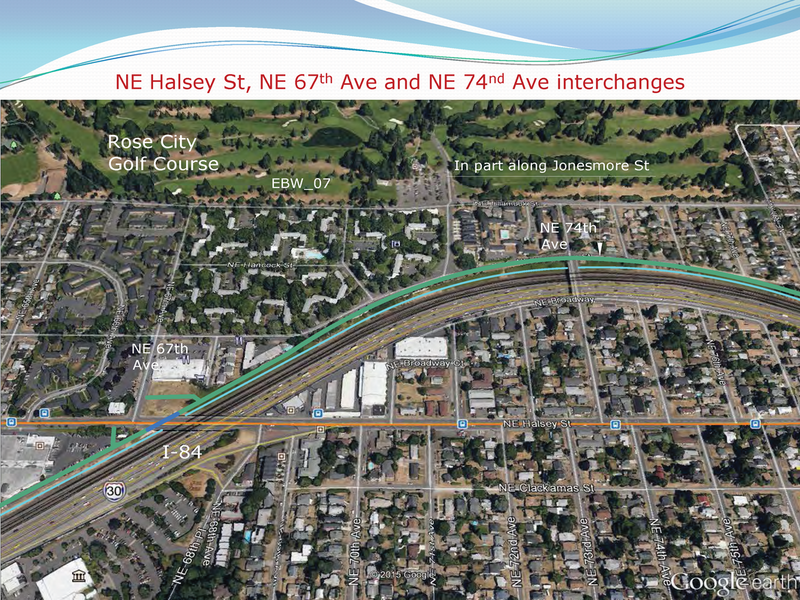 It is now time to roll up our collective NE neighborhood representative’s sleeves and work on a financial action plan that is basically an offer the City can’t refuse. 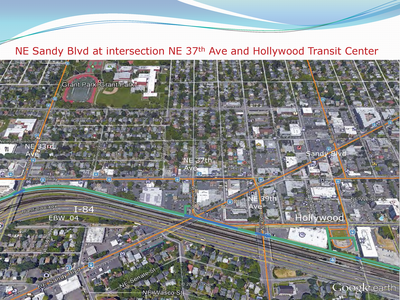 Engineering: $2.5 million first phase from the Willamette River to the Hollywood Transit Station. $1.25 million will be privately raised via Nike, Addidas, etc. 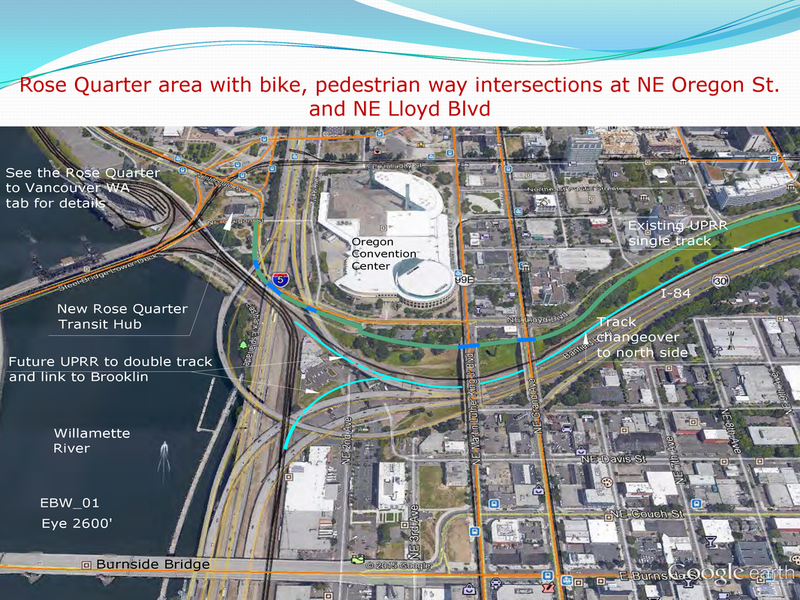 and the City of Portland matching it with existing Convention Center Urban Renewal District funds. 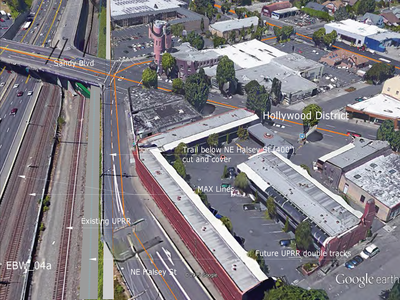 Engineering: $2.5 million second phase from the Hollywood Transit Station to Gateway Green. 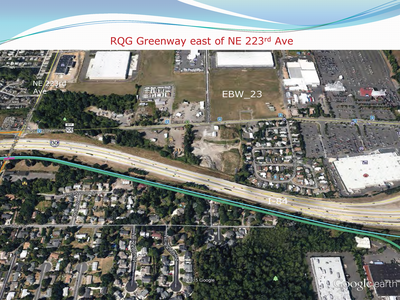 $1.25 million from Providence Hospital, Legacy, etc. and the City of Portland matching it. 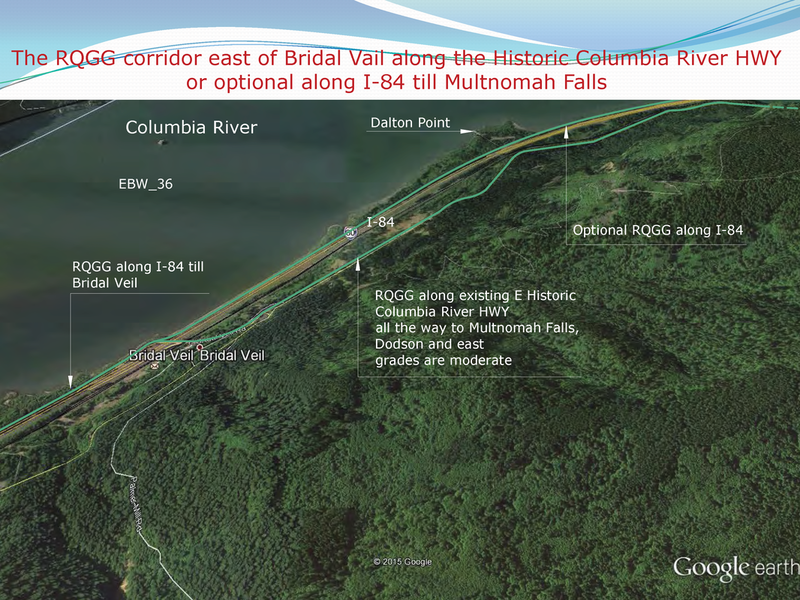 *The question is, “Do the neighborhoods along I-84 wish to have a continuous, safe bikeway between the Willamette River and Multnomah Falls?” This new trail concept should be called the Rose Quarter to Gorge Trail (RQGT) because it would historically connect two rivers via the approximate path of an old Indian trail. 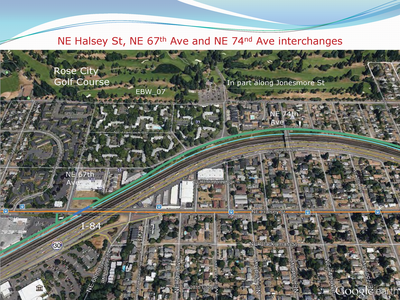 If we encourage Mayor Hales to create a new urban renewal district from NE 16th Avenue to the eastern City limits of Portland, we create our own financial payment plan for RQGT development and other NE neighborhood improvements. 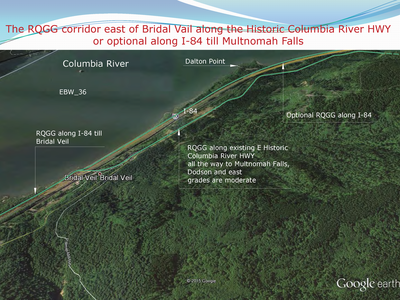 Think of it as a string of pearls, with the pearls being the bridgeheads across I-84 where development is enticed to occur with a freeway for bike riders: recreational riders to Multnomah Falls and commuters to Providence, Lloyd Center and downtown Portland. 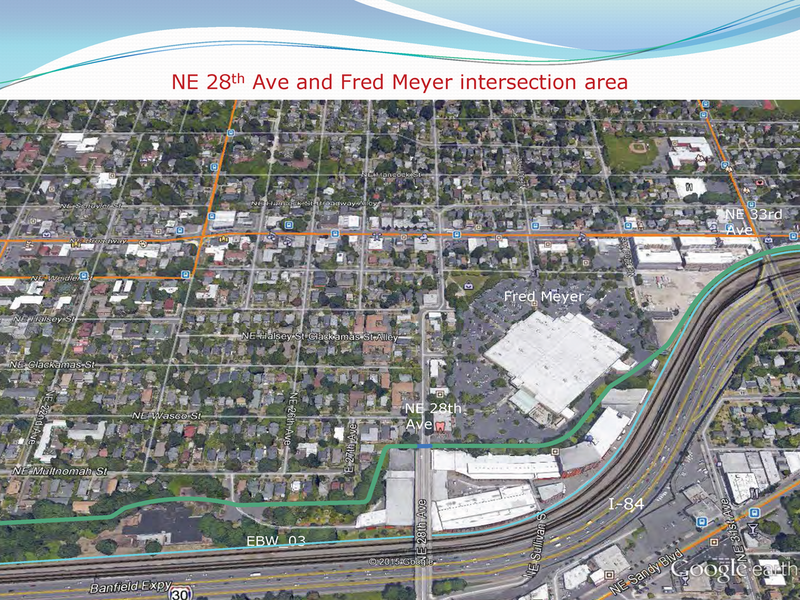 With development plans already in the works for NE 21st, 33rd and 42nd Avenues, why not capture the tax increment funds that are going to occur from these projects? This is a “no brainer” without taxing existing properties as a Limited Improvement District (LID) would. 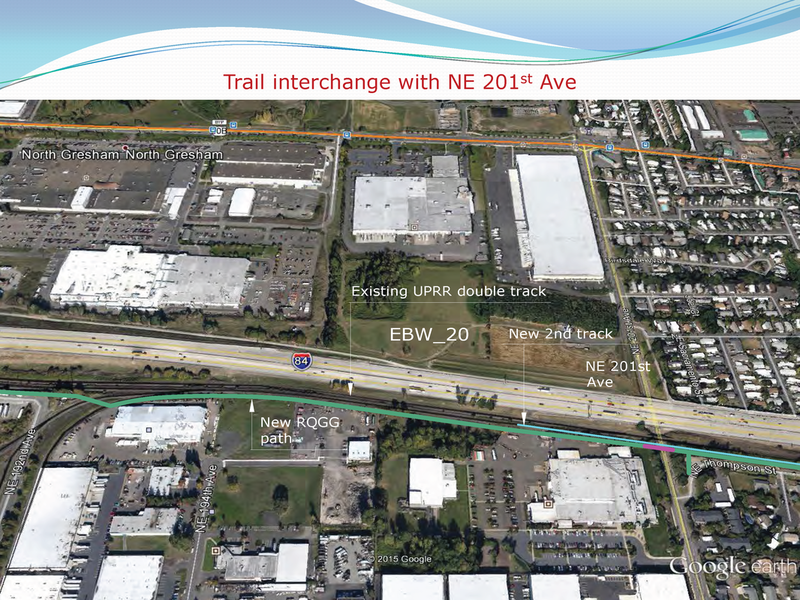 If you are interested in making a trail for the next 100 years a reality, meet us at noon on April 29th at McMennamin’s east private room on NE 15th and Broadway. Click on the first slide to begin the slide show. 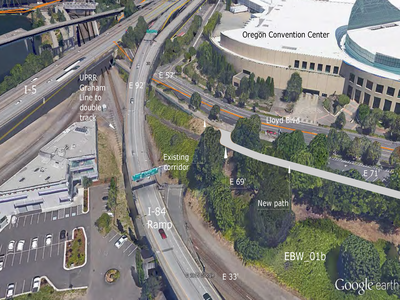 Click or tap on the right to advance, to the left to reverse. 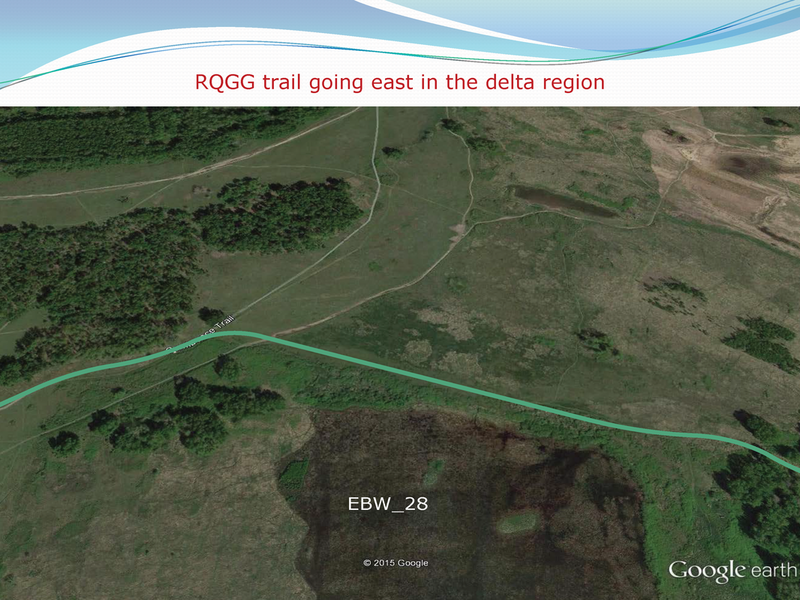 Click outside the window to leave the slideshow. 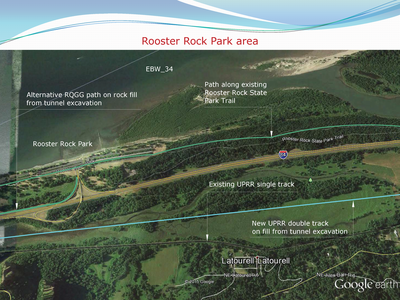 Or use these images to go directly to the slide you need.